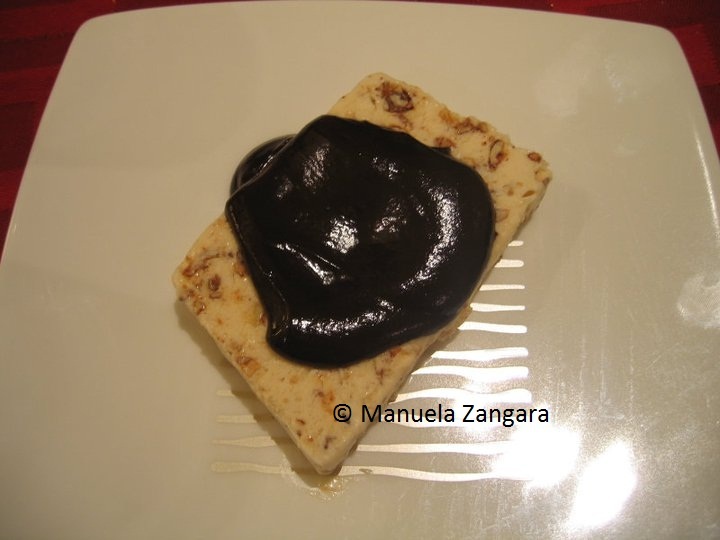 This is a typical Sicilian “semifreddo”, a semi-frozen dessert. It is usually served with a hot dark chocolate sauce and the contrast between hot and cold, sweet and bitter are DIVINE! Put the almonds on a baking pan and bake them in the oven at 160°C fan forced till toasted (make sure not to burn them though, or they will become bitter!). After they cool down, chop them roughly with an electric mixer. They do not have to become a powder, just keep them chunky. Then place them in a non stick frying pan with 60 gms of caster sugar and cook on a slow fire till the sugar melts. Keep stirring. When the sugar has browned, put the “croccante” (toffee) to cool on a sheet of baking paper. Make sure to spread it well, so it will cool down fast. When cool, break it in pieces and chop it thinly with an electric mixer. In the meantime, whip the cream with the icing sugar and put it in the fridge. Then whip the egg whites with a pinch of salt till firm. Separately, whip the egg yolks with 100 gms of caster sugar till pale. Add the powdery croccante, the egg whites and the whipped cream. Mix gently with a wooden spoon making sure that the mixture does not lose volume. Line a rectangular bread tin (20cm x 8cm) with cling wrap, pour the mixture in it and cover it with more cling wrap. Place in freezer overnight. Serve each slice with a hot chocolate sauce (good quality dark chocolate melted with very little milk).